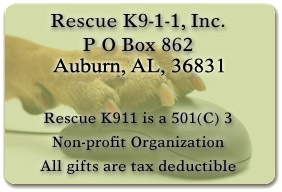 Donate « Rescue K911 is an animal shelter located in Camp Hill, AL. Only with your help is our work with the homeless possible. We depend entirely on donations to fund our rescues, which always include medical care, spaying and neutering as well as necessary vaccinations. Many of our rescued dogs come into our care with severe medical problems and as a result, vet bills can become overwhelming. All donations go directly to the animals’ care and help provide food, shelter and medical treatment. Your loving charitable (& tax deductible) gift gives us the power to be the salvation for abandoned dogs! As a 501(C)3 non-profit organization, we are desperately in need of your generous donations! Many corporations offer matching gift programs that can double and even triple your gifts to Rescue K911! Be sure to check with your personnel or community affairs office. Send a check, donate stock, vehicles & more. By donating Stock you own to Rescue K911 before the end of the year, you can receive tremendous tax benefits. You will receive a tax deduction for the current market value of the stock on the date of your gift, and avoid paying any gain if the stock has appreciated since you acquired it. Include Rescue K9-1-1, Inc in your estate plan. Learn more about Planned Giving opportunities by clicking here. Would you like to donate your vehicle to help the animals of Rescue K911??? 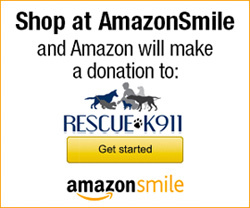 You can donate your car, truck, RV, boat, motorcycle, or other vehicle to Rescue K911. If if you would like to speak with us about a special donation item or you feel that you have something that we can use, please contact us.